Are you heading to BlizzCon® 2017? If you're going to be exploring the show floor, you're going to want to stop by the ROG booth in Hall C. The ROG team will be giving away collectible BlizzCon 2017 coins dispensed from custom Blizzard vending machines. But there's a little more to this sweet swag offer than you might think. With each coin, you have the chance to receive a rare Golden Ticket which you can redeem at the ROG booth for an awesome Gold Level prize. And that's not all. Instead of taking the Gold Level prize, you can opt to power up to the Ultimate Prize level by hunting down a fellow Golden Ticket holder. 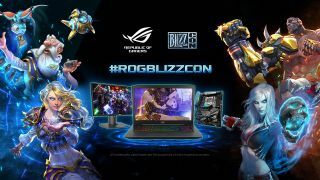 Use the #ROGPOWERUP tag on social media to coordinate with other BlizzCon attendees, bring your tickets to the ROG booth, and earn a randomly selected ROG laptop, motherboard, or monitor. While you’re at the ROG booth, make sure to check out their latest hardware! Come down to Hall C in the Anaheim Convention Center on November 3rd and 4th to get your collectibles and prizes! We'll see you at BlizzCon!